The Daily Dimwit: Is it Friday yet? Or at least happy hour? Rough day yesterday everyone... work was a pain... then I wrecked my car on the way home. In a three car wreck, mine was the only one with any visible damage. Yes, it was my fault and it was due to the one factor that has caused every wreck I've been in: following too close. Gotta fix that. 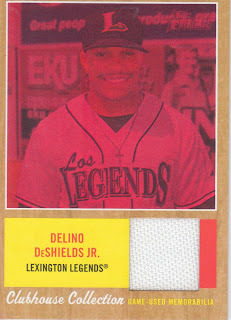 Delino had a big of a rough first year, having gotten caught with a DUI/DWI can't remember which. Didn't help that he was also 18... I'm really hoping this 1st round pick can turn things around and get his career going in the right direction, and not just be another failed Astros draft pick (that's a large and infamous club to join). 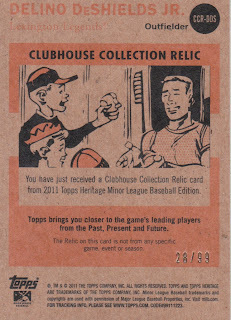 I like the card for sure, the red tint gives it an odd look but the fact it's numbered /99 is cool to me as well. The photo was apparently was taken during Lexington's Hispanic Heritage day as his jersey says "Los Legends" and I'm guessing that's not the usual jersey style. Well, that's all for today folks... hope your day today is better than mine was yesterday. Sorry to hear about the wreck and glad that you're ok. I just can't get over how those red tinted cards look. I like colored refractors with the different colored borders, but I'm not a fan of the tint on the face of the card. I like serial numbered stuff so it does have that going for it. good luck w/ the car. must of been something about the phases of the moon. My wife ran into a pole while rounding a corner at the convenience store y-day. When I first started working I had a work colleague that graduated HS w DeShields Sr. boy does HR make me feel old. Glad you're alright man. Hopefully your weekend is much less eventful than that. I love the DeShields Jr. He has a high ceiling if he can just tap into his skills more and stay out of trouble off the field. I think we'll see him in Houston within 2-3 years.